I was watching this auction - it went for £300 + fees so in total £366! Thats more than a rare Unfinished Tales ! 461. Tolkien (J.R.R.) 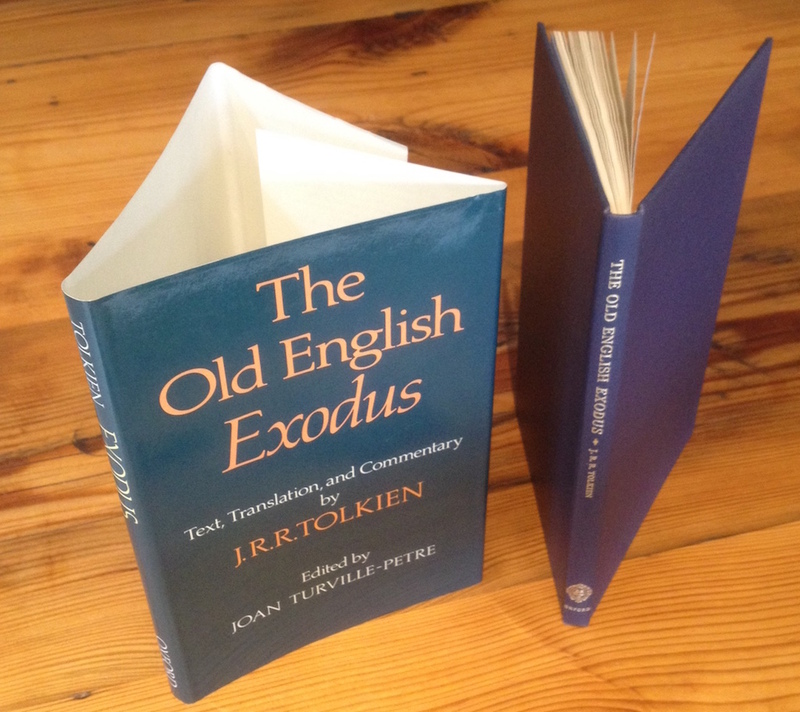 The Old English Exodus, first edition, edited by Joan Turville-Petre, ink inscription to endpaper, original boards, dust-jacket, price-clipped, a very good copy, 8vo, Oxford, 1981. Is it all that uncommon? I mean, there were three thousand copies printed. I have two of 'em; where's all the rest? WorldCat shows almost 600 known copies in libraries at this time. Assuming over the last thirty years many libraries purged their copies, I would venture a guess that most copies went straight to library collections, not to the collector market. I rarely see these coming up for sale in nice shape (not ex-library). Doesn't mean it is a rare book, but it is scarce for collectors. It looks like someone bought the copy. Was it anyone from TCG? These definitely seem to be getting cheaper, finally (although they might have a little way to come down still). I picked up a near-fine unread copy (only issue is that the "Exodus" lettering on the spine has faded from orange to yellow) for $118 on eBay. Quite possibly the only book I will buy this year, so I'm happy enough at the price paid. Yeah. Was glad to find it. It seems like there should be plenty of them out there, really, even if half (at a guess) ended up in various libraries. I expect there will be plenty of them floating about with pages removed to disguise their library origins at some point. I don't normally bid on auctions in the US or ones that use the Global Shipping Program, but I made an exception for this one, which was in Utah (and spent quite a bit of time making sure the seller packaged it properly in an appropriately sized flat rate box with internal padding, rather than a padded envelope). eBay still opened it, but at least they didn't repackage or do any damage. I figure if you overpack or under-pack, you are screwed when it comes to GSP auctions. That said, it arrived very quickly (less than a week). I bought a copy many years ago - so long that I can't even remember whether it was on eBay, Abebooks, or some other online portal - from someone who had only listed the title and the editor. I paid a good price (for me, not for him); he then took ages to send it to me, and I was worried that he had realised what he had, and sold it to someone else for a higher price. But it turned up in the end. There's a copy of Old English Exodus on AbeBooks right now for $500 - more than I am willing to pay, but perhaps someone here really wants it.